"Respiratory Care" redirects here. For the medical journal, see Respiratory Care (journal). A clinician auscultating the chest of a pediatric patient. A respiratory therapist is a specialized healthcare practitioner trained in pulmonary medicine in order to work therapeutically with people suffering from pulmonary disease. Respiratory therapists graduate from a community college or university with a certification in respiratory therapy and have passed a national board certifying examination. The NBRC (National Board for Respiratory Care) is the not-for-profit organization responsible for credentionaling the seven areas of Respiratory Therapy. Those seven areas of Respiratory Therapy include, as of December 2017: CRT (Certified Respiratory Therapist), RRT (Registered Respiratory Therapist), CPFT and RPFT (Certified or Registered Pulmonary Function Technologist), ACCS (Adult Critical Care Specialist), NPS (Neonatal/Pediatric Specialist), and SDS (Sleep Disorder Specialist). Respiratory therapists work in hospitals in the intensive care units (Adult, Pediatric, and Neonatal), on hospital floors, in Emergency Departments, in Pulmonay Functioning laboratories (PFTs), are able to intubate patients, work in sleep labs (polysomnograpy) (PSG) labs, and in home care specifically DME (Durable Medical Equipment) and home oxygen. Respiratory therapists are specialists and educators in many areas including cardiology, pulmonology, and sleep therapy. Respiratory therapists are clinicians trained in advanced airway management; establishing and maintaining the airway during management of trauma, and intensive care. Respiratory therapists initiate and manage life support for people in intensive care units and emergency departments, stabilizing, treating and managing pre-hospital and hospital-to-hospital patient transport by air or ground ambulance. In the outpatient setting respiratory therapists work as educators in asthma clinics, ancillary clinical staff in pediatric clinics, and sleep-disorder diagnosticians in sleep-clinics, they also serve as clinical providers in cardiology clinics and cath-labs, as well as working in pulmonary rehabilitation. Respiratory therapists educate, assist in diagnosis, and treat people who are suffering from heart and lung problems. Specialized in both cardiac and pulmonary care, Respiratory Therapists often collaborate with specialists in pulmonology and anaesthesia in various aspects of clinical care of patients. Respiratory therapists provide a vital role in both medicine and nursing. A vital role in ICU is the initiation and maintenance of mechanical ventilation and the care of artificial airways. Respiratory therapists are also primary clinicians in conducting tests to measure lung function and teaching people to manage asthma, chronic obstructive pulmonary disorder among other cardiac and lung functions. Internationally, Respiratory Therapists that provide lung function testing are termed respiratory scientists, but in North America, they may be a Respiratory Therapist or may also be a certified pulmonary function technician in the United States. In the clinic or outpatient setting Respiratory Therapists assist with diagnosis and serve as an educator for patients suffering from cardiac and respiratory illness. In the United States, Respiratory Therapists with certification as Registered Respiratory Therapists evaluate and treat patients with a great deal of autonomy under the direction of a pulmonologist. In facilities that maintain critical care transport teams Respiratory Therapists are a preferred addition to all types of surface or air transport. In other settings Respiratory Therapists are found in schools as asthma educators, working with teachers and coaches about childhood symptoms of asthma and how to spot an emergency. In the United States, legislation has been introduced several times to allow Respiratory Therapists certified as asthma specialists with registered Respiratory Therapist certification to prescribe and manage previously diagnosed respiratory patients in physician clinics. In sleep clinics, Respiratory Therapists work with physicians in the diagnosis of sleep-related illnesses. Respiratory Therapists in the United States are migrating toward a role with autonomy similar to the nurse practitioner, or as an extension of the physician like the physician assistant. Respiratory Therapists are frequently utilized as complete cardiovascular specialists being utilized to place and manage arterial accesses along with peripherally-inserted central catheters. Pulmonary rehabilitation may be initiated as a treatment as a source for continuity of improvement after a hospital stay or as a therapeutic way to increase quality of life. Pulmonary rehabilitation is intended to educate the patient, the family, and improve the overall quality of life and prognosis for the patient. Pulmonary Rehabilitation involves therapies and evaluations by Respiratory Therapists, Occupational Therapists and Physical Therapists. In the United States and Canada, Respiratory Therapists are healthcare practitioners who, after receiving at least an Associate of Science in Respiratory Care, complete a credentialing process. After satisfactorily completing the required examinations and being added to a registry, the practitioner is then eligible to apply for a license to practice in the region governed by their respective licensing body. In the United States, specialist Respiratory Therapists are clinicians who hold National Board for Respiratory Care specialty credentials, which may include neonatal/pediatric specialist (CRT-NPS or RRT-NPS), adult critical care specialist (RRT-ACCS), sleep disorder specialist (CRT-SDS or RRT-SDS), and pulmonary function technologist (CPFT or RPFT). The NBRC's RRT-ACCS examination is the newest NBRC examination: it was introduced in 2012. Professional credentials denoted as a certified Asthma Educator (AE-C) may also be earned by passing the National Asthma Educator Certification Board (NAECB). In some parts of Canada, one may practice as a Provisional Respiratory Therapist after graduating, until writing and passing the CBRC exam. In Canada, similar credentialing and advanced training exists. Except for the United States and Canada, very few countries have a dedicated professional role for respiratory health. In these countries, respiratory care is provided by physiotherapists, nurses and physicians that have chosen to specialize in this field. In many countries this recognition is in a transition stage; as an example, in 2011, hospitals in Beijing, China began a recruitment drive to acquire Respiratory Therapists for their intensive care units where previously nurses were the only clinician. Upon graduation from an accredited school of respiratory therapy, the graduate is then eligible to write the national exam administered by the Canadian Board for Respiratory Care. Success on this examination will then allow the Respiratory Therapist to register with any licensing body in Canada. Alberta, Manitoba, New Brunswick, Newfoundland and Labrador, Nova Scotia, Ontario, Quebec and Saskatchewan are the Canadian provinces with provincial licensing bodies; in these provinces, it is illegal to practice the profession of Respiratory Care without first being licensed as a full or provisional member with the provincial licensing body. These provinces are so-called regulated provinces. In some provinces, one may work provisionally upon graduating, until writing and passing the exam. In all other jurisdictions, the licensing body for the profession of Respiratory Care is the Canadian Society for Respiratory Therapy. Registration as a full member is optional for Respiratory Therapists living in regulated provinces, however, for Respiratory Therapists living in non-regulated provinces, registration as a full member with the CSRT is compulsory. Registration with the provincial regulatory body or the CSRT (in non-regulated provinces) confers upon the Respiratory Therapist the title of Registered Respiratory Therapist (RRT). Canada and the United States recognize each their cardio-pulmonary education structure as equal, however a qualifying exam must be written in order to practice in either nation. There is pressure for the program to become a degree, as other therapies (Physical Therapy, Occupational Therapy) now require a master's degree or greater. However, in some places such as Alberta, Canada the cardio-pulmonary course work are only offered at technical schools which are unable to grant a formal degree. Respiratory therapy is a sub-specialty of physical therapy in France. Respiratory care as a specialty is regulated by the Fédération Française des Masseurs Kinésithérapeutes Rééducateurs. The German Respiratory Society first issued a resolution to develop the dedicated Respiratory Therapist (RT) role in 2004 as a means to increase the quality of patient care, delegate physician duties and respond to the observed increase in respiratory conditions and diseases. In 2006, a year-long pilot training program was offered to established nurses and physiotherapists. Researchers report that significant additional work is necessary to define and position the role of the Respiratory Therapist within the current healthcare system. In Italy, the title of the Respiratory Therapist can be acquired applying to the Master's degree in Respiratory Therapy. It consists of frontal lessons and various internships throughout Italian hospitals. In Philippines Respiratory Therapists are clinicians who have been awarded at minimum a Bachelor of Science in Respiratory Care degree. Licenses to practice respiratory care are regulated by the Professional Regulatory Board of Respiratory Therapy and Professional Regulation Commission which is established and legally maintained by the Philippine Respiratory Therapy Act (Republic Act No. 10024). In United Arab Emirates Respiratory Therapists must have been awarded a Bachelor of Science in Respiratory Care. An additional two-years of experience is required for foreign applicants. Licenses are maintained and awarded by the Dubai Health Authority. The Dubai Health Authority restricts Respiratory Therapists to working only in physical medicine and rehabilitation Centers, in hospitals, in surgical clinics with cardio-thoracic surgeons and with physicians in family/general practice or pulmonology. Saudi Arabia utilizes Respiratory Therapists in a similar fashion to Canada and the U.S. Some Respiratory Therapists from North America travel to Saudi Arabia for temporary need. A Respiratory Therapist teaches students about the dangers of smoking. In the United States a Respiratory Therapist is a clinician who has at a minimum completed an Associate of Science in Respiratory Care degree along with a certification process. 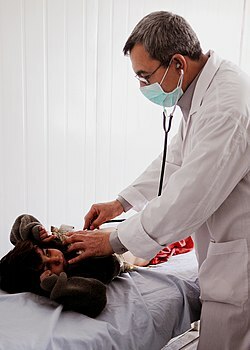 After satisfactorily completing required examinations either administered by the National Board for Respiratory Care or directly by the individual state licensing board (either the medical examiners board or a special state respiratory care board), the practitioner is then eligible to apply for a license to practice in the region governed by their respective licensing body.. There are two recognized governing bodies in the United States: the State Board of Respiratory Care in the state in which a Respiratory Therapist is licensed to practice and the National Board for Respiratory Care (NBRC), a non-profit organization which regulates two levels of certification along with some additional specialist certifications. The Certified Respiratory Therapist (CRT) is the certification given after successfully passing the Therapist Multiple Choice NBRC-TMC exam; the Registered Respiratory Therapist (RRT) certification is given after first making the RRT cutting score on the TMC exam, and passing the Clinical Simulation Exam NBRC-CSE. Most state boards of respiratory care require proof of the appropriate NBRC credential and award various license titles, including (but not limited to) Respiratory Care Practitioner, Licensed Registered Respiratory Therapist, and Licensed Certified Respiratory Therapist. There has been a substantial push to standardize the state licensure by the American Association for Respiratory Care. The NBRC credential is renewed every 5 years for a fee in addition to fees assessed by the state boards of respiratory care. Respiratory therapy in the UK is not a recognized specific profession, but a specialisation route available to physicians, nurses, physiotherapists and occupational therapists. Common titles include Cardio-Respiratory Physiotherapist, Clinical Respiratory Physiologist, Respiratory Nurse and Cardio-Respiratory Occupational Therapist. All UK trained Physiotherapists receive advanced training in Respiratory Therapy theory and practice as a core component of their pre-registration Physiotherapy degree programme. Following qualification and a period of rotations throughout the core areas of Physiotherapy practice, they may then follow a career pathway specialising in Respiratory Physiotherapy. Areas of practice include Critical Care, respiratory medicine, Cystic Fibrosis, Asthma, Hyperventilation Syndrome, general and specialised surgery, non-invasive ventilation, ventilation weaning, cardiac and pulmonary rehab, respiratory therapy outpatient clinics and community respiratory therapy. The Association of Chartered Physiotherapists interested in Respiratory Care is the specialist interest group for UK Physiotherapists working within the field of Respiratory Therapy. All Physiotherapists working within the United kingdom must be registered with the Health and Care Professions Council, regardless of their area of clinical practice, in order to be allowed to work in both the public and private sectors. Respiratory Physiotherapy postgraduate master's degree and PhD programs exist within the United Kingdom for suitably qualified and experienced therapists. For Respiratory Physiologists, a Bachelor of Science in Clinical Physiology is issued with a specialist option in respiratory physiology. Beyond degree level, Master of Science programs in Respiratory Care, Respiratory Disease Management, Advanced Cardiology and Clinical Respiratory Physiology are available. The traditional role of the operating room Respiratory Therapist has included providing technical support to the anesthesiologist for the proper use and maintenance of the anesthetic gas machine, in addition to also providing airway management. This role in the operating room has evolved to include a more advanced and specialized role with increasing responsibilities to the Respiratory Therapist. Respiratory Therapists are academically prepared to perform activities such as sedation by administration of anesthetic gases and medications, insertion and management of vascular (arterial and venous) access and assessment of the depth of anesthesia under the guidance of an anesthesiologist or nurse anesthetist. This role is similar to the nurse anesthetist, except that an Anesthesia Assistant must have an anesthesiologist supervising them and a nurse anesthetist, does not. Asthma specialists work with clinics, hospitals and schools as an educator for teachers, parents, patients and practitioners on asthma and allergies. Respiratory Therapists in the role as an Asthma Educator additionally help diagnose and treat asthma and other respiratory illness. Additionally, an Asthma Educator is the resource clinician in inpatient and outpatient environments for evaluating and advising physicians on treatment plans and helping facilitate patient understanding and compliance with the plan. In the United States, Certified Asthma Educators (AE-C) are credentialed by the National Asthma Education Certification Board (NAECB). In Canada, the Canadian Network for Respiratory Care administers two certifications for the specialization as Respiratory Therapist Asthma Educator, the Certified Asthma Educator (CAE) (preferred by practitioners with a pediatric focus) and the Certified Respiratory Educator (CRE), which comprises the CAE program with additional training in COPD. Respiratory Therapists work with people suffering from cystic fibrosis in clinics and hospitals by educating them about their disease and working with them on a treatment plan. While admitted to a hospital, patients with cystic fibrosis have their treatment schedule modified and maintained by Respiratory Therapists. Maintaining a healthy schedule for pharmokonetic and physical therapeutic airway clearance typically more frequent than home treatment plans because admissions are usually due to an increased need for therapy during the stay. Respiratory Therapists are able to fulfill the role of Perfusionist with appropriate training. The perfusionist is a highly trained member of the cardiothoracic surgical team (often time an RT with extra training) which consists of cardiac surgeons, anesthesiologists, physician assistants, surgical technicians, other Respiratory Therapists, and nurses. The perfusionist's main responsibility is to support the physiological and metabolic needs of the cardiac surgical patient so that the cardiac surgeon may operate on a still, unbeating heart. Perfusionist certifications are maintained and awarded by The American Board of Cardiovascular Perfusion. Extracorporeal membrane oxygenation (ECMO) is a modified cardiopulmonary bypass technique used for the treatment of life-threatening cardiac or respiratory failure. An ECMO Clinical Specialist is a technical specialist trained to manage the ECMO system including blood pump, tubing, artificial oxygenator, and related equipment. The ECMO Specialist is also responsible for the clinical needs of the patient on ECMO which may include bedside management of oxygenation and carbon dioxide removal, maintenance of normal acid-base balance, administration of medications, blood and blood products, and maintenance of appropriate anticoagulation therapies for the blood. This ECMO Clinical Specialist may be the bedside critical care nurse specifically trained in ECMO patient and circuit management, or the ECMO system may be primarily managed by a registered Respiratory Therapist, or physicians with training as ECMO clinical specialists. Much like adult intensivist Respiratory Therapists, neonatal and pediatric specialists deal primarily with managing life support for the pediatric or neonatal patient. Pediatric Respiratory Therapists are trained extensively in antenatal and intrapartum patients and family. In the United States a specialist certification exists and is awarded by the National Board for Respiratory Care. Available to Respiratory Therapists holding certification as a certified Respiratory Therapist or registered Respiratory Therapist however the registered Respiratory Therapist is preferred by most institutions. A pediatric patient prepared for a polysomnogram by a Respiratory Therapist. Respiratory Therapists monitor, interpret and diagnose findings from a sleep study, as well as the medical history and physical exam to make the diagnosis and decide on treatment related to sleep-disorders. A sleep study can also help diagnose narcolepsy. Case management is a collaborative process that assesses, plans, implements, coordinates, monitors, and evaluates the options and services required to meet the client's health and human services needs. It is characterized by advocacy, communication, and resource management and promotes quality and cost-effective interventions and outcomes. Eligibility and certification is maintained by the Commission for Case Management Certification, a body certifying healthcare professionals in the United States. Respiratory Therapists work with nurses, physicians, and paramedics in emergency flight and ground transport. They are a vital practitioner delivering care inside helicopters, air ambulance or ground ambulance working to pick up a patient and move them to a facility that has what they need. In the United States certification for transport (C-NPT) is currently awarded by The National Certification Corporation. Respiratory Therapists are sometimes referred to as Respiratory Scientists who are specialists in pulmonary function. Respiratory Therapists work with Pulmonologists in both clinical and general research of the respiratory system, ranging from the anatomy of the respiratory epithelium to the most effective treatment of pulmonary hypertension in pediatrics. Scientific research also takes place to look for causes and possible treatment in diseases such as asthma and lung cancer. The profession of respiratory care was officially established in the United States c. 1930; and respiratory research has officially existed since the early 1900s. During the early years, Respiratory Therapists were referred to as "oxygen technicians", and most of their activities involved moving cylinders of compressed gas and administering oxygen via nasal catheter or oxygen tent. Most oxygen technicians were trained on the job, although brief training programs began to appear in the late 1940s and 1950s. Today the profession hardly resembles what it was in the 1940s. Respiratory Therapists provide direct care, patient education, and care coordination. They are academically trained in respiratory nursing and respiratory medicine. They practice in acute care facilities, long-term acute care facilities, skilled nursing facilities, assisted-living centers, subacute care units, rehabilitation centers, diagnostics units, and in the home. Respiratory Therapist training has also dramatically changed. Current accreditation standards require Respiratory Therapists to have, at minimum, an Associate of Science in Respiratory Care degree from an accredited program. Legal requirements to practice respiratory therapy have also dramatically changed. 49 states now legally recognize Respiratory Therapists. Limited permits or state licenses are now required in all states except Alaska, which has no statutory authority over the practice of respiratory care. Most states that have a licensure requirement also require continuing education. In 2007 the American Association for Respiratory Care (AARC) began developing recommendations for the promotion of the field of respiratory care in the United States in response to increased concern regarding licensure and credentialing issues as well as international recognition of those practicing in the United States. The task force decided to recommend that by 2015 the minimum education requirement for licensure and certification as a Respiratory Therapist be a bachelor of science in respiratory therapy (BSRT). The AARC task force also recommended the American Respiratory Care Foundation change its scholarship policies and only award assistance and grants to those working toward a bachelor's degree. The Committee on Accreditation for Respiratory Care (CoARC) was asked by the AARC task force to change its accreditation standards and no longer accredit associates level respiratory care programs. The CoARC replied by a press release rejecting the recommendation. In 2011 legislation introduced by the AARC will help improve the use of Respiratory Therapists in clinical applications by allowing them to manage patients suffering from asthma and COPD seeing a clinic for routine checkups. Similar bills have been introduced before and have died in committee. ^ "PCC Notes: Respiratory students train". The Reflector. Archived from the original on 5 August 2016. Retrieved 6 November 2011. ^ Harbrecht BG, Delgado E, Tuttle RP, Cohen-Melamed MH, Saul MI, Valenta CA (2009). "Improved outcomes with routine Respiratory Therapist evaluation of non-intensive-care-unit surgery patients". Respiratory Care. 54 (7): 861–7. PMID 19558737. ^ O'Malley RJ, Rhee KJ (1993). "Contribution of air medical personnel to the airway management of injured patients". Air Med J. 12 (11–12): 425–8. doi:10.1016/S1067-991X(05)80138-5. PMID 10130326. ^ Shelledy DC, Wiezalis CP (2005). "Education and credentialing in respiratory care: where are we and where should we be headed?". Respiratory Care Clinics of North America. 11 (3): 517–30. doi:10.1016/j.rcc.2005.04.003. PMID 16168918. ^ Rowley DD, Mayo DF, Durbin CG (May 2000). "Initial experience with a Respiratory Therapist arterial line placement service". Respiratory Care. 45 (5): 482–5. PMID 10813223. ^ Li J, Zhan QY, Liang ZA, Tu ML, Sun B, Yao XL, et al. (2011). "Respiratory Care Practices and Requirement for Respiratory Therapists in Beijing ICUs". Respiratory Care. 57 (3): 370–6. doi:10.4187/respcare.01093. PMID 22005194. ^ "Master Universitario in fisioterapia e riabilitazione respiratoria | ARIR Associazione riabilitatori della insufficienza respiratoria". www.arirassociazione.org (in Italian). Archived from the original on 2017-12-31. Retrieved 2017-12-30. ^ Karg O, Bubulj C, Esche B, Geiseler J, Bonnet R, Mäder I. [The Respiratory Therapist]. Pneumologie. 2008;62(11):685-9. ^ Sapienza, Enzo. "Master Universitario in fisioterapia e riabilitazione respiratoria | ARIR Associazione riabilitatori della insufficienza respiratoria". www.arirassociazione.org (in Italian). Archived from the original on 2017-12-31. Retrieved 2017-12-30. ^ American Association for Respiratory Care (2010-03-12). "Philippines Enacts Licensure for RTs". Archived from the original on 2011-12-05. Retrieved 2012-02-12. ^ Kabiling, Genalyn (2010-03-19). "Gov't regulates practice of respiratory therapy". Manila Bulletin. Philippines: Manila Bulletin. Archived from the original on 2010-03-26. Retrieved 2012-02-10. ^ Dubai Health Authority. "Allied Healthcare Professionals' Licensure" (PDF). Dubai Health Authority (DHA). Archived from the original (PDF) on 2012-04-17. Retrieved 2012-02-03. ^ a b c Kacmarek RM, Durbin CG, Barnes TA, Kageler WV, Walton JR, O'Neil EH (2009). "Creating a vision for respiratory care in 2015 and beyond". Respiratory Care. 54 (3): 375–89. PMID 19245732. ^ "Five facts about AAs". American Academy of Anesthesiologist Assistants. Archived from the original on 2006-09-26. Retrieved 2010-11-25. ^ Davis JJ, Bailey WC (2006). "Teach a man to fish and you have fed him for a lifetime". Chest. 129 (2): 220–1. doi:10.1378/chest.129.2.220. PMID 16478832. ^ "Clinical Perfusionists Currently Certified by the American Board of Cardiovascular Perfusion through December 31, 2010". American Board of Cardiovascular Perfusion. Archived from the original on February 13, 2010. Retrieved 2010-02-15. ^ Dalton HJ (2011). "Extracorporeal life support: moving at the speed of light". Respiratory Care. 56 (9): 1445–53, discussion 1453-6. doi:10.4187/respcare.01369. PMID 21944690. ^ a b c Kashani KB, Farmer JC (2006). "The support of severe respiratory failure beyond the hospital and during transportation". Curr Opin Crit Care. 12 (1): 43–9. PMID 16394783. ^ Beninati W, Meyer MT, Carter TE (2008). "The critical care air transport program". Crit Care Med. 36 (7 Suppl): S370–6. doi:10.1097/CCM.0b013e31817e3143. PMID 18594265. ^ DiBlasi RM, Cheifetz IM (2011). "Neonatal and pediatric respiratory care: what does the future hold?". Respiratory Care. 56 (9): 1466–80. doi:10.4187/respcare.01505. PMID 21944692. ^ Epstein LJ, Kristo D, Strollo PJ, Friedman N, Malhotra A, Patil SP, et al. (2009). "Clinical guideline for the evaluation, management and long-term care of obstructive sleep apnea in adults". J Clin Sleep Med. 5 (3): 263–76. PMC 2699173. PMID 19960649. ^ "Archived copy" (PDF). Archived (PDF) from the original on 2012-04-13. Retrieved 2013-06-19. CS1 maint: Archived copy as title (link). (Accessed on June 18, 2013). ^ Cheifetz IM (2011). "Management of acute lung injury: sharing data between adults and children". Respiratory Care. 56 (9): 1258–68, discussion 1268-72. doi:10.4187/respcare.01413. PMID 21944680. ^ Curley MA (2011). "Respiratory research in the critically ill pediatric patient: why is it so difficult?". Respiratory Care. 56 (9): 1247–54, discussion 1254-7. doi:10.4187/respcare.01255. PMID 21944679. ^ "Smother Small Dog To See it Revived. Successful Demonstration of an Artificial Respiration Machine Cheered in Brooklyn. Women in the Audience, But Most of Those Present Were Physicians. The Dog, Gathered in from the Street, Wagged Its Tail". New York Times. May 29, 1908. Retrieved 2007-12-25. An audience, composed of about thirty men and three or four women, most of the men being physicians, attended a demonstration of Prof. George Poe's machine for producing artificial respiration in the library of the Kings County Medical Society, at 1,313 Bedford Avenue, Brooklyn, last night, under the auspices of the First Legion of the Red Cross Society. ^ Smith GA. Respiratory care: evolution of a profession. Lenexa, Kansas: AMP; 1989. ^ Pierson DJ (2001). "The future of respiratory care". Respir Care. 46 (7): 705–18. PMID 11403703. ^ Weilacher RR. History of the respiratory care profession. In: Hess DR, MacIntyre NR, Mishoe SC, Galvin WF, Adams AB, Saposnick AB, editors. Respiratory care: principles and practice. Philadelphia: Saunders; 2002. ^ Commission on Accreditation of Allied Health Education Programs, or a diploma from an accredited school. Standards and guidelines for the profession of respiratory care. 2003. "Archived copy" (PDF). Archived (PDF) from the original on 2009-03-06. Retrieved 2012-02-03. CS1 maint: Archived copy as title (link). Accessed January 7, 2009. ^ Shelledy DC, Wiezalis CP (2005). "Education and credentialing in respiratory care: where are we and where should we be headed?". Respiratory Care Clin N Am. 11 (3): 517–30. doi:10.1016/j.rcc.2005.04.003. PMID 16168918. ^ a b Barnes TA, Kacmarek RM, Kageler WV, Morris MJ, Durbin CG (2011). "Transitioning the respiratory therapy workforce for 2015 and beyond". Respiratory Care. 56 (5): 681–90. doi:10.4187/respcare.01169. PMID 21276324.